We all have quotes or signatures at the bottom of our emails don’t we? Mine is from Carl Sagan, visionary. I am of an age where the time I need to invest in learning to use technology is overwhelming. I also have a personal bias against the inanities of the “twitterverse”. I feel we are raising a generation so introspective that they really do believe the world should care about what they had for breakfast. So much introspection breeds delusions of grandeur; this world needs more inflated egos like I need a hole in the head. I concede that situations like the Haiti earthquake were covered in the first person by Twitter and that kind of direct communication did contribute to the global action in support of the survivors, but each week, alongside the news topics, are just as many followers for pop culture like Justin Bieber or LOST. That self-referential “digital noise” really turns me off. After reading the article, I would also concede that the author feels his Twitter network keeps him motivated. As I seem to be in a bit of a rut right now, I guess I can understand that. 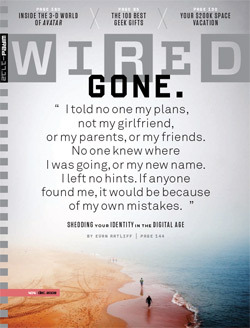 By the way, the Dec. 2009 issue of WIRED ( yes, I do read a variety of periodicals- even those on technology on occasion) had a very interesting article about Evan Ratliff who decided to shed his identity one month to see if it were possible to hide in plain sight in the digital age. For one month he travelled around the U.S. with those who were trying to find him close on his heels. They set up networks, FACEBOOK, blogs and Twitter etc. to share information; “where is Evan Ratliff?” In the end, his Twitter posts were his undoing and he was found on day 25. What connected for me was that an institution sprung up instantly to solve a problem. Members did not compete, they collaborated (Vanish Team). I found this saga to be a parable for how knowledge will be disseminated and shared in the future and what we need to prepare our students for. Wired Magazine: Where is Evan Ratliff? Just blathering on a Sunday afternoon. I need to pay my bills electronically so I am using email as a task avoidance strategy. (<~~ yes I realize the irony of ending this with a self-referential statement).